Having a diamond certified in a gemological laboratory is the surest way of knowing what a diamond is worth. Diamond graders evaluate diamonds based on color, weight, clarity and cut. They use specific measuring equipment and software developed in Antwerp. Based on the results of the lab, a certificate is drafted, describing every detail of the stone. Only 2 institutions offer certificates that are accepted around the world: the Gemological Institute (GIA) and HRD Antwerp. Antwerp is the heart and soul of Galeries du Diamant, therefore we choose to partner with the world renowned Antwerp gemological laboratory HRD Antwerp, the Hoge Raad voor Diamant or Diamond High Council. Founded in 1976 by the Antwerp World Diamond Centre the AWDC and owned by the state of Belgium, HRD is highly respected by the international community for the reliability of its certificates and for its integrity. 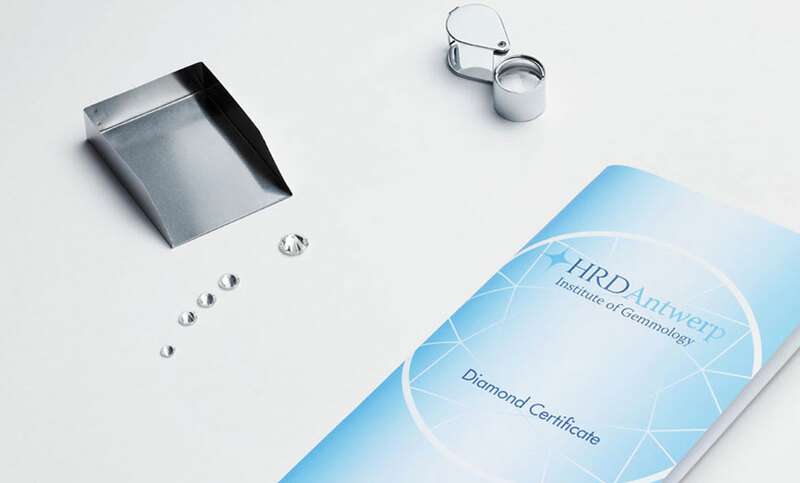 HRD certificates are fully compliant with the rules for grading polished diamonds set by the International Diamond Council (IDC) and approved by the World Federation of Diamond Bourses (WFDB) as well as the International Diamond Manufacturers Association (IDMA), the industry's two leading representative bodies. To guaranty their authenticity and value, all our diamonds are sold together with their HRD certificate. 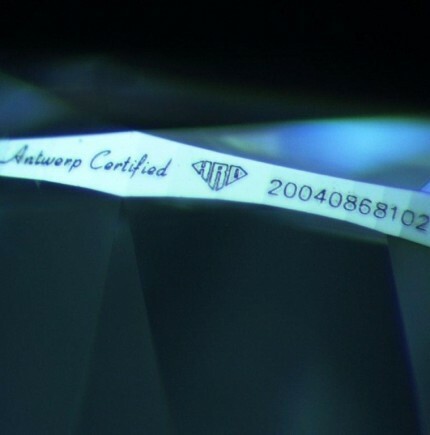 Each diamond is laser-engraved with its unique certificate number, only visible on the girdle, the thin outer edge, with the help of a microscope. While invisible to the naked eye, this number provides added security to the diamond’s owner and can be verified online through HRD directly. 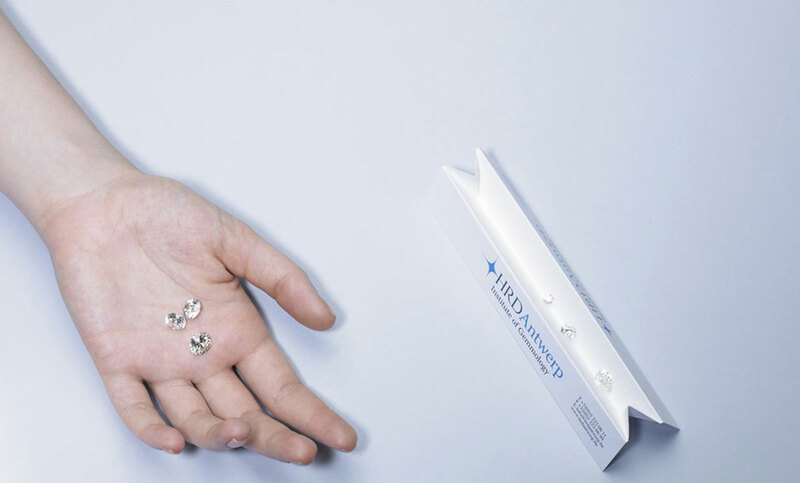 HRD Antwerp set a high value on informing consumers about the diamonds they buy. When purchasing an HRD Antwerp certified diamond you can rest assured the characteristics described in its accompanying certificate have been thoroughly checked by expert gemologists. An HRD Antwerp certificate represents the hallmark of authentic European quality and allows any consumer to purchase diamonds or jewelry in full confidence. 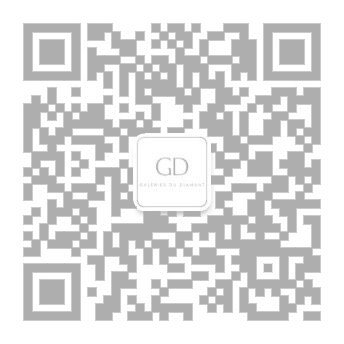 Be careful: the certificate must also specify whether it refers to a natural diamond, lab-grown diamond or treated diamond. Check the certificate carefully before you complete your purchase. If the price seems too good to be true – it probably is.